Village West Pool has annual and monthly memberships with rates based on household size. Annual members become voting members of Village West Pool after a full year of membership. Unlike most pools in the area, VWP annual members pay NO bond fee. Given the communal, non-profit nature of the pool, annual members participate in our volunteer program. Members are assessed a $100 volunteer fee per household in addition to the membership fee. The volunteer fee is fully refundable upon completion of 10 hours of volunteer work during the season (01 October - 30 September). For fewer than 10 hours worked, refunds are issued on a prorated basis by November 1. For more information, see our About Us page. New annual members are not voting members. New members are eligible for a 20% discount on the membership fee. In addition, new members pay a $30 volunteer fee that is fully refundable upon completion of 3 hours of volunteer work during the season (01 October - 30 September). For fewer than 3 hours worked, refunds are issued on a prorated basis by November 1. For more information, see our About Us page. Monthly members are not voting members. A monthly membership is valid for 30 consecutive days from the day of purchase. Monthly members are not eligible for senior citizen or new member discounts. A pro-rated volunteer fee is incorporated into the monthly membership rate since these members are not involved in the pool year-round. Membership rates are based on the number of members of your household, age 2 and up, who intend to use the pool. Members must be part of a single household. Divorced families in which neither parent has remarried may be considered part of a single household. Annual members may include one child-care provider (a nanny, babysitter, or relative) on their membership without counting this person toward their membership household size. Please note the name of this person in the additional notes section of your membership or renewal form on our website. Note: Membership rates in this table do NOT include the fully refundable volunteer fee ($100 for annual members, $30 for new members). The volunteer fee will be automatically included when you are paying for your membership. Any monthly or renewing annual members who are members of the Civic Association of West Springfield Village receive a $20 discount off their membership. This credit can be used only once per year for monthly members. Use coupon code CAWSV during checkout. 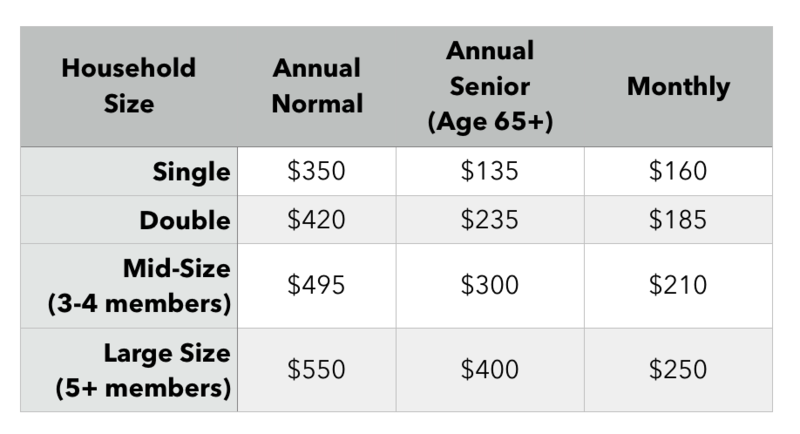 Annual memberships in which the head of household is age 65 or older by May 1st of the pool season year are eligible to receive the discounted senior citizen rate for their membership. Proof of age may be required to receive this rate. To use this discount, select one of the Senior Citizen membership categories when registering. New annual members receive a one-time, 20 percent discount on their membership, and their volunteer program fee is discounted to $30 (or three hours of work). Households that were monthly members in a prior year and join as first-time annual members are also eligible for this discount. To use this discount, select one of the New Annual Member membership categories when registering. Pro-rated annual memberships are available for families who must move out of the area mid-year due to a job assignment. Please contact us to arrange for this type of membership. Bring a guest with you to enjoy Village West Pool. Guest passes are available for purchase and are $5 each or 10 for $45. A primary member must be present with guests while using the facility. Friends who want to join you at VWP but who will not be swimming are free but must wear a colored wrist band provided at the guard shack.